cero (Contemporary Exotica Rock Orchestra) is an experimental pop band with roots in folk and funk. They formed in 2004 playing mainly in bars. They recorded two demo CDs and appeared on a few compilations, including a Haruomi Hosono (Yellow Magic Orchestra) tribute. Their first full-length World Record was released a few weeks ago. 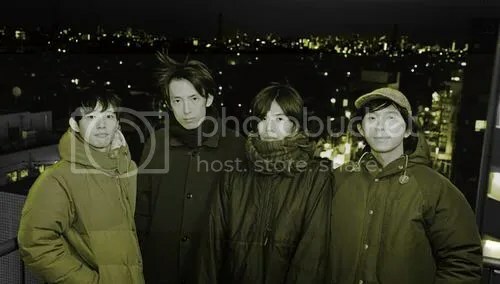 The only thing available on cero’s myspace page is an album digest for World Record, which was uploaded last May even though the album just came out. But you can listen to the entire album elsewhere on myspace for free. It’s just listed under the myspace page of the Spanish rapper of the same name. I first heard of cero when I posted the chill-out “Daiteiden No Yoruni” on J-Rock Fridays. But there’s actually a fair bit of happy-go-lucky songs here, with a lot of songs featuring marimba, vibraphone, accordion and harmonica. “Nizyuuiseeikino Hiderinomiyakoni Amegafuru,” which sounds like a trolly car ride, is my favorite of those. It’s also fun hearing the vocalist experiment with hip hop on “exotic penguin night” and “World Record.” Another standout “(I found it) Black Beard” is just one big island party. Then there are the songs that return to the soft-rock formula such as “outdoors” and “Anonoka,” which ends in a pretty epic drone out. They balance the album out nicely. It’s the contrast between the beautiful melodies and fun that make cero a standout indie pop band. Buy World Record at CD Japan. Download at Amazon.com and HearJapan.